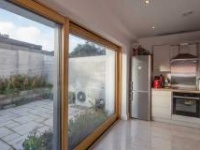 Over many years, the Passive House Planning Package (PHPP) has proved extremely successful for planning new passive house buildings as well as retrofits according to the Enerphit standard. With PHPP version 9.1, released in 2015 with many new features and additions, building designers and energy consultants have an efficient digital tool at their disposal with which they can optimise their designs. In the early design phase, it is recommended that the planning tool designPH is used. This functions as a 3D data input interface for PHPP, and is available as a plugin for the design software SketchUp. 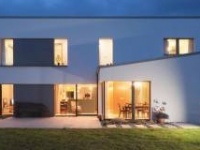 For passive house buildings designed with PHPP and designPH, planned energy demand matches exceptionally well with actual consumption, both in the case of passive house new builds and in existing buildings which have been retrofitted to the Enerphit standard. The comfort level in these buildings also meets or exceeds expectations and in most cases these construction projects can be implemented cost-effectively. Major differences between the planned energy efficiency target and actual energy consumption, known as the performance gap, do not arise with passive house and Enerphit buildings — this has been proven over the years in numerous monitored projects. 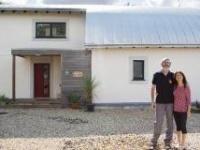 PHPP is just as well-known as the passive house standard itself. It forms an important basis for the successful implementation of passive house concepts and technologies, and is an excellent tool to plan for regulatory building programs. This year, the tried-andtested software was revised and re-released as version 9.1. A short summary of the most important functions is presented below. Building refurbishments all over the world can now be certified in accordance with the internationally applicable Enerphit criteria. In addition to the requirements for heating or cooling demand, component criteria which have been sub-divided into seven international climate zones are also now available. In this way, planners can specify the corresponding minimum standard for the relevant building components in a refurbishment project depending on the climate data of the location. In addition, the requirements for the cooling demand are determined depending on the usage-related internal loads or the climaterelated cooling and dehumidification demand. Now it is possible to enter different efficiency parameters within a single PHPP file, whereas several PHPP calculations were required previously. The results of the variants are sorted into columns and calculated in parallel so that one can easily compare the effects of these parameters. Other profitability comparisons can be made in a separate worksheet. In this way, different refurbishment steps can also be entered in a single PHPP file, and their influence on the efficiency level can be depicted. Retrofit projects which are scheduled to be completed over a long period of time can thus be documented and evaluated in a convenient way. The implementation of the variant functions of the PHPP was completed as part of the EU-funded project EuroPHit (www.europhit.eu) and tested using pilot projects. A systematic review of the message function for missing data input or input errors was completed so that instructions or warning messages are now shown in a consistent manner in each calculation sheet, and then summarised in a newly created worksheet for this purpose. In this way, the user can quickly identify the places where data is either incorrect or incomplete and needs to be checked or reviewed. PHPP 9 also includes many more input options for calculating the distribution losses of hot water pipes. The program takes into account significantly more piping systems, including heat recovery systems for drain water from showers. In order to be able to evaluate the demand for hot water in more detail, it is possible to display the energy saving potential, for example, of flow-optimised fittings. Worldwide, the energy sector is undergoing rapid change, with the objective of achieving a sustainable energy supply. A planning tool for energy efficient buildings such as PHPP must be able to evaluate a building structure on this basis as well, because the calculated energy demand may largely be met by renewable energy in future. It therefore makes sense to evaluate the energy demand of buildings that are planned today based on such a future scenario. This has already been realised in the PHPP 9 on the basis of the renewable primary energy system (primary energy renewable/PER). With immediate effect, the new system with renewable primary energy can be used to evaluate buildings as an alternative to the previously used evaluation method, which depends on the non-renewable primary energy factors (PE). The new passive house certification classes — classic, plus and premium — are based on the new PER evaluation concept. These classes allow evaluation of the building's efficiency, taking into account the interplay of energy efficiency and renewable energy generation. Furthermore, the classic passive house standard with a heating demand of 15 kWh/m2/yr and a primary energy demand of 120 kWh/m2/yr without additional renewable energy generation will continue in parallel. According to the new evaluation system based on PER, this standard corresponds to the passive house classic class. Two other classes, passive house plus and passive house premium, allow a further increase in the efficiency of the building using the corresponding system technology and additional energy gained from renewable energy sources. Thus PHPP 9 allows tomorrow's buildings to be planned today in a future-proof way. The planning tool designPH is a 3D data entry interface for PHPP, compatible with the latest version. It is installed as a plugin for the wellknown 3D modelling software SketchUp and offers the user two additional tools: one for entering building data and one for energy-relevant analysis and data export into PHPP. In addition to this, the main window displays all building envelope components of the generated model with geometric and energy-relevant data. The most important features are described in detail below. DesignPH automatically recognises all opaque and transparent components of the building model and automatically assigns these to the required group of building components such as the exterior wall, roof or window. The identified components are first allocated standard energy values. However, the specified U-values of building components or windows can be adjusted individually for each building component or selected from a list of certified passive house components in PHPP. An energy assessment of the model is displayed after the analysis of the building model in designPH. The displayed heating demand is based on a simplified energy balance calculation according to the annual method in PHPP, which already takes into account the shading situation of each window. 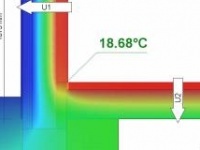 General overall values are still used for calculating some efficiency parameters such as the ventilation concept. Despite this, the building design can already be optimised in designPH with reference to energy efficiency. The building model can thus be analysed quickly and easily, particularly in the case of complex buildings, saving valuable time. Once the design has been analysed and optimised with reference to energy efficiency, all geometric building data such as the treated floor area, envelope areas, thermal bridges, windows and shading parameters can be exported and transferred into PHPP’s data sheets. In this way, the PHPP building model is quickly prepared and the user only has to adjust the parameters assumed as general values in designPH and enter the additional data for determining the heating demand. In this way, the effort required for entering project data into PHPP is considerably reduced. Development of designPH is an ongoing process; new functions and additions are already in progress. While the current version automatically recognises and calculates the shading factors based on PHPP, the upcoming version of designPH will determine the shading parameters more accurately. Furthermore, the user interface of designPH will be structurally revised with reference to clarity and ease of operation for more complex projects. Thus, for the purpose of identification or optimisation, individual building components will automatically be highlighted, and the display of the energy balance will be supplemented with analytical charts. Besides very detailed input of thermal bridges, it will also be possible to specify other energy-relevant components in designPH, so that the integrated energy balance calculation is improved and also so that the amount of graphically depicted data flowing into designPH is increased. In addition to the full version of designPH, which can only be obtained in combination with a registered version of PHPP, a demo version is now also available which can be downloaded free of charge from www.designph.org. Furthermore, students and educational institutions are now able to obtain designPH Edu for a discounted license fee. This special version is available as a bundle with the PHPP 8. DesignPH Edu is also offered as a semester license for a limited period of time. However, compared with designPH Pro, some functions are limited.